Seven Doors to Islam reveals the religious worldview and spiritual tradition of the world's one billion Muslims. Spanning the breadth of Islamic civilization from Morocco to Indonesia, this book demonstrates how Muslims have used the literary and visual arts in all their richness and diversity to communicate religious values. Each of the seven chapters opens a "door" that leads progressively closer to the very heart of Islam, from the foundational revelation in the Qur'an to the transcendent experience of the Sufi mystics. 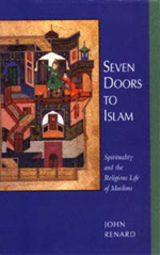 However, unlike most studies of Islam, which see spirituality as the concern of a minority of mystical seekers, Seven Doors demonstrates its central role in every aspect of the Islamic tradition. John Renard is the author of In the Footsteps of Muhammed: Understanding Islamic Experience (1992), Islam and the Heroic Image: Themes in Literature and the Visual Arts (1993), and All the King's Falcons: Rumi on Prophets and Revelation (1994). He is Professor of Theological Studies at St. Louis University.